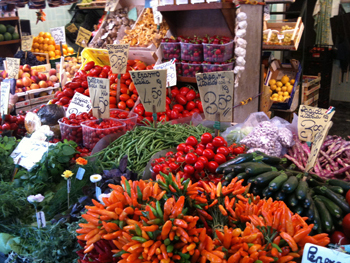 Venetians have depended on the Rialto markets since 1097 for their daily supplies of fish, vegetables, fruit, and other foodstuffs. 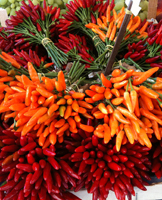 The market runs from 8am till noon. 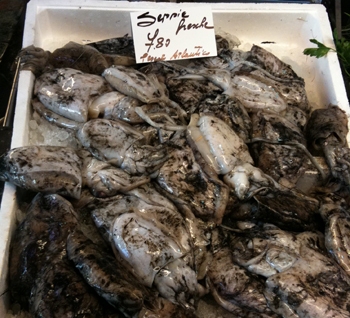 The markets are open in the mornings from Monday to Saturday; the fish market is closed on Mondays. There are several good butchers and food stores around the market area, selling gourmet foodstuffs, oils, wine, pasta and regional specialties. The markets are located alongside the Grand Canal, to the northwest of the Rialto Bridge in the district of San Polo (the opposite side to San Marco). Sepia and shown with black ink. 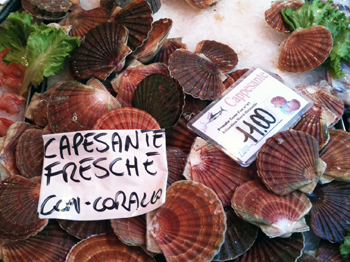 This is one of the more popular dishes found throughout Venice. Try it in pasta and risottos. 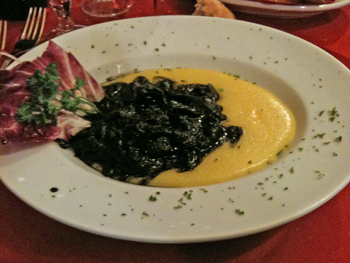 One of the specialties of Venice is the Sepia with black ink... shown here with polenta. Photo taken at Osteria Antico Dolo. Spider Crabs known as Granseole are found in the marshes around the lagoon. 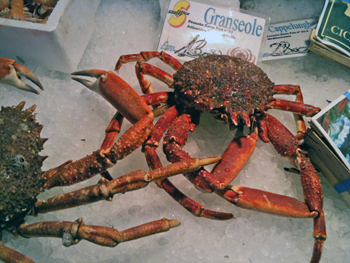 Granseole are a delicacy whenever you eat them. But in spring and autumn young male crabs shed their shells in order to grow larger ones. The soft shell crab version is called Moleche and is a cooking delicacy. 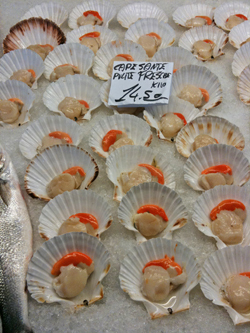 Scallops in shell with roe. 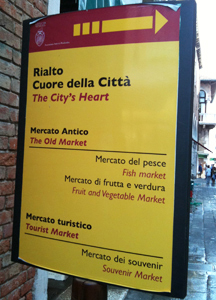 The Rialto Market is not just a fish market but has a wide selection of fruits and vegetables. 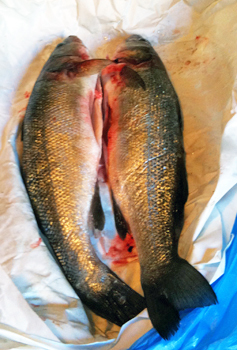 Branzino from the Rialto fish market -- cleaned and ready to be cooked. The cost of buying fish and preparing it yourself is a fraction of what it will cost in a restaurant. Be prepared to pay 4-8 euros/ 100 grams in a restaurant. 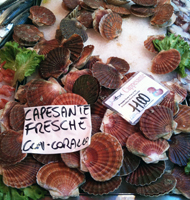 The price at the fish market runs from 7-15 euros/kilo. 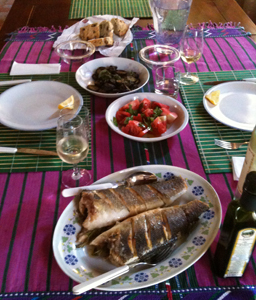 Shown here are the branzino served with sautéed eggplant, seasonal tomatoes with basil and excellent olive bread.